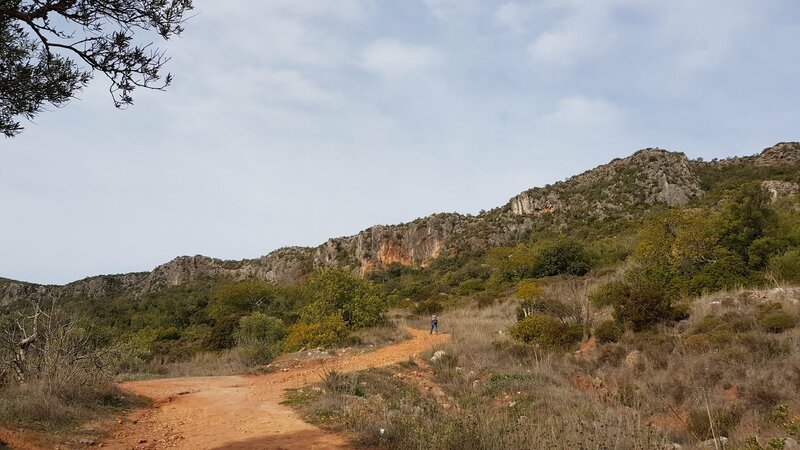 The influence of the Atlantic was already becoming evident as we crossed Seville, with brown giving way to green as the predominant colour in the landscape, and cork oaks mingling in with orange trees supplanting the olive groves. Crossing the suspension bridge over the Riu Guadiana at the border, there’s no sudden visual change, unsurprisingly, and even the language on the signposts could be mistaken for Spanish. 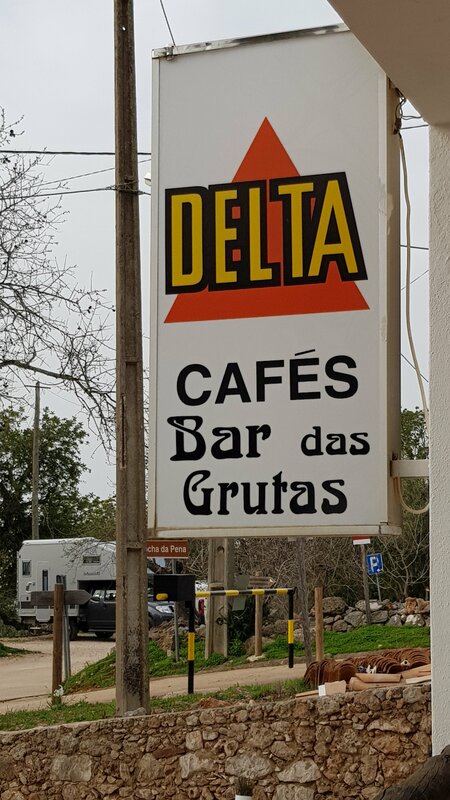 However, as soon as you stop to talk to people the change abundantly clear, as spoken Portuguese sounds utterly different – so many ‘s’ sounds and something almost eastern European about the overall impression. Driving ever westward we bypass the built up coastal strip of the Algarve along the speedy (but expensive) A22 before turning inland around Faro for our first stop-off . 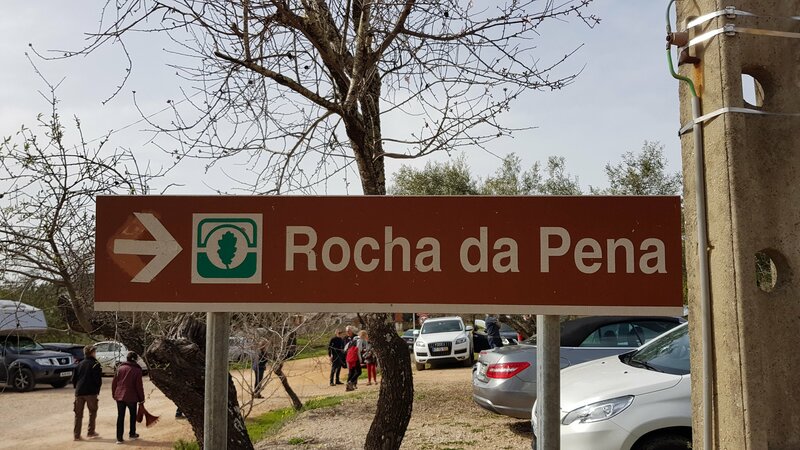 Rocha da Pena. This is a craggy hill above the village of the same name, set amongst rolling green hills. 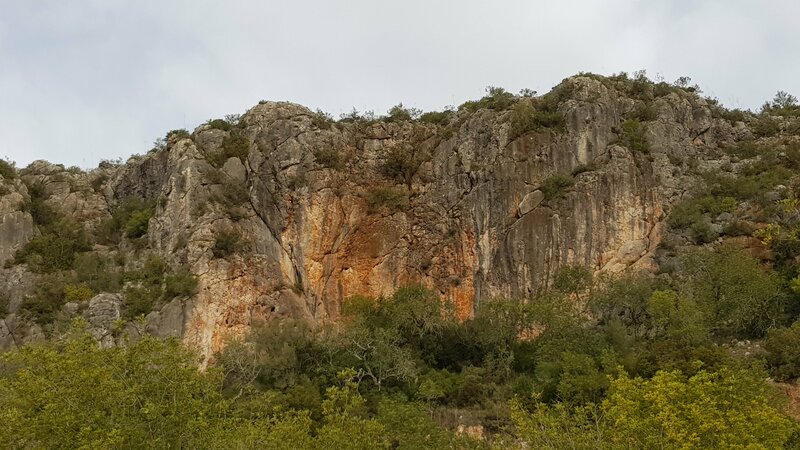 There are a dozen or so buttresses spread over an escarpment stretching for a couple of miles – not hugely impressive from a distance, with the central orange wall of sector Carpe Diem being the most eye-catching feature. 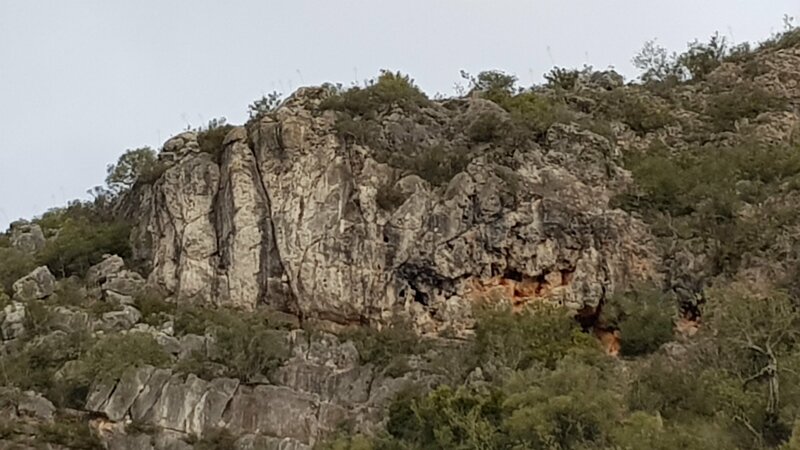 On closer inspection the crags are more interesting than first impressions would suggest, made up of highly featured and very pockety rock, with generally steep starts providing plenty of punch for routes that belie their stature of typically 15 to 20m. Jake (aged 4): Can we go to the cafe now? Helen: Yes, as soon as I’ve finished this route. Jake: But you climb as slow as a turtle! Nothing much has changed since, with the same bar and proprietor at the parking area beneath the crag (and of course Helen doesn’t climb slowly and never did!) Surprisingly, the routes are generally not too polished (despite being the only mainstream sports climbing destination for a couple of hundred kilometres) and there’s been a bit of further development with a smattering of new routes pencilled in on the topo available at the bar. 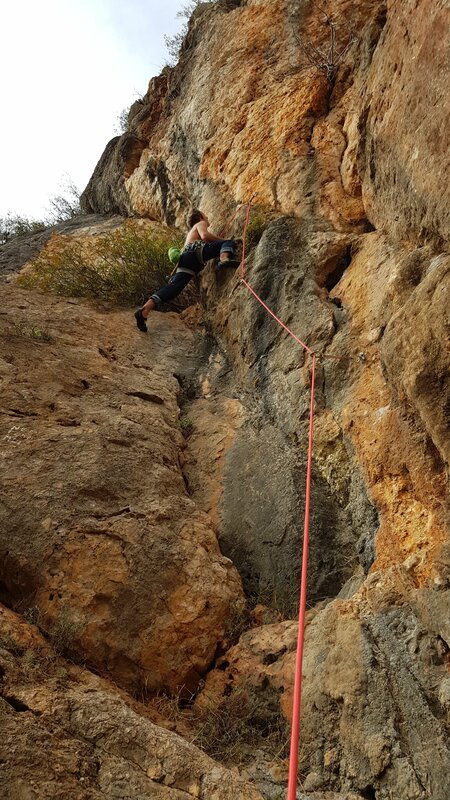 (minus impatient son), and had a good day at sectors Aguia and Carpe Diem (the eponymous route, 6c, is outstanding!) before heading rightwards to sector Grossen Problem for a last couple of climbs. 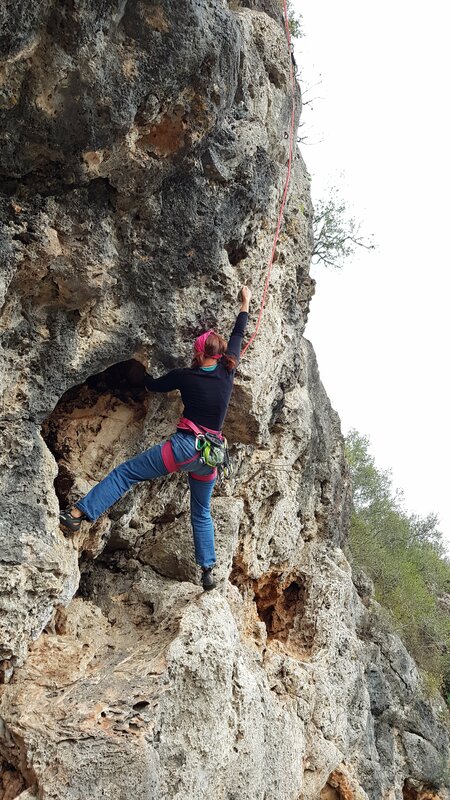 and I was surprised and pleased to manage Marafada, 6c+/7a which is even more bouldery. With a good day under our belts we headed for a beer at the bar with a plan to stay another day. I caused much confusion with the bar owner by asking if it was OK to park for the night in our fire – mixing up ‘fuego’ with ‘furgo’ meaning van. He didn’t seem too put out but mimed that we’d need to keep the flames down! That prompted another couple of beers and a peaceful night. Day 2 saw us venture a bit further left to sector inferno – lots more pockets, on grey rock rather than orange, but still plumb vertical. 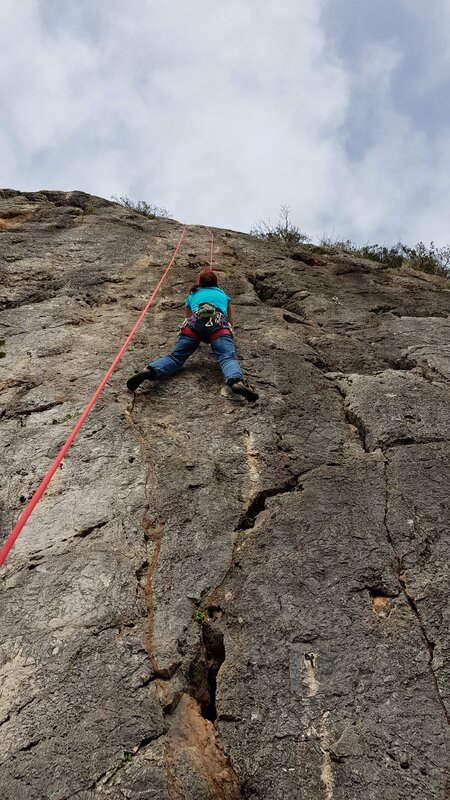 Then back to Carpe Diem for a crack at Moura Encontida, a somewhat tougher 7a up the imposing orange headwall – just a bit too fingery for me.